Jean Alexandre François LeMat*, a French physician living in New Orleans, patented the LeMat revolver in the United States on October 21, 1856. The fearsome weapon fired nine .42 or .36 caliber shots from a top barrel, while the lower barrel delivered a massive 16 gauge shotgun blast. Effective range of the LeMat was 40 yards with a maximum range of 100 yards. The LeMat revolver was manufactured from 1856 to 1865, with approximately 2,900 being produced. An over and under designed firearm, the LeMat was considered the most lethal small arm during close range combat. The revolver shotgun combo makes it difficult to even refer to it as a pistol. 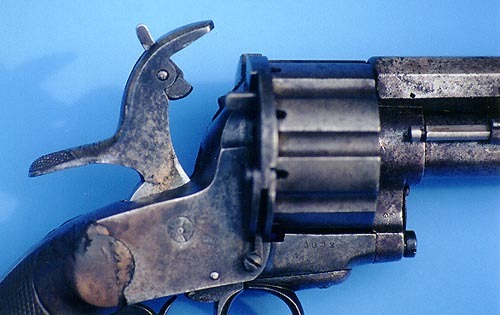 (Above) A close-up of the hammer on a LeMat Revolver, showing the pivoting striker that could be used to fire either the pinfire cartridges in the revolving chambers or the secondary smoothbore barrel. To protect his invention, the inventor, LeMat, applied for and received patents in a number of European countries, including France. Dr. Jean LeMat hoped to market his adaptable revolver as a primary sidearm for dragoons and other mounted troops. He entered into a partnership with P.G.T. Beauregard (at that time a major in the U.S. Army) in April 1859 to market his handgun to the U.S. Army. Beauregard, besides being LeMat's cousin, was one of the first U.S. Army officers to resign and join the Confederacy. (Right) The name of the person who carried this LeMat pistol during the Civil War is not known. However, because of a visit to the museum four decades ago by a young Charles Frazier, millions of people have either read about Inman's LeMat in Cold Mountain or seen it in the motion picture. 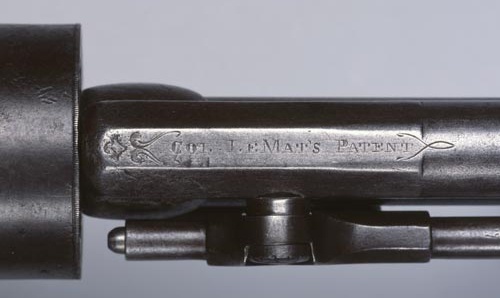 At the outbreak of the Civil War, LeMat secured a contract from the Confederate Ordnance Department to provide 5,000 of the pistols, and he traveled to the safety of Paris to begin manufacturing them. However, roughly 2,900 were produced, with approximately 2,500 used by the Confederacy. The first shipments of these pistols passed through the Union blockade into the Confederacy during the summer of 1862. Although these LeMats were originally intended for Confederate naval officers, many ended up in the hands of cavalry officers and other high-ranking Confederates. Generals J. E. B. Stuart and P. G. T. Beauregard both carried LeMat pistols. When Andersonville Prison commander Henry Wirz surrendered to Union officers, he turned over a LeMat to his captors. In the award winning movie Cold Mountain, W. P. Inman located a LeMat on the battlefield and quickly put it to use. In 1963 the North Carolina Civil War Centennial Commission purchased this LeMat pistol for the Civil War centennial exhibit in the Hall of History (now the North Carolina Museum of History). The LeMat went on display, and among the thousands of visitors who saw it was a young boy from the North Carolina Mountains named Charles Frazier. The size and formidability of the weapon so impressed Frazier that years later, while writing the best-selling novel Cold Mountain, he remembered it and included a LeMat in the story—as the pistol carried by Inman, the main character. Although only high-ranking officers normally had LeMats, it was not uncommon for an enlisted soldier such as Inman to take one off the battlefield for his own use. The LeMat revolver didn't change the outcome of the war and it didn't turn the tide of a single battle, but to the soldier who owned it, there was a sense of empowerment, a psychological advantage, and confidence and exuberance unmatched by those without the revolver. The mid-19th century was a time in American history that gave birth to a number of innovative firearm designs. This unique sidearm was also known as the "Grape Shot Revolver." It was developed in New Orleans in 1856 by Dr. Jean Alexander Le Mat, whose manufacturing effort was backed by P.G.T. Beauregard, who became a general in the Confederate Army. About 2,900 were produced. 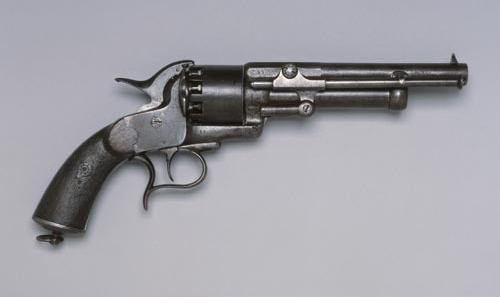 The distinguishing characteristic of LeMat's revolver is that its 9-shot cylinder revolves around a separate central barrel of larger caliber than the chambers in the cylinder proper. The central barrel is smooth-bore and can function as a short-barreled shotgun (hence the name "Grape Shot Revolver") with the shooter selecting whether to fire from the cylinder or the smooth-bore barrel by flipping a lever on the end of the hammer. Flipping the lever up caused the movable striker to fall upon the primer set directly under the hammer, discharging the lower barrel, while leaving it in the standard position would fire the chambers in the cylinder, much like any other revolver. LeMat originally chambered his pistol for .40 (or .42) caliber revolver bullets, with a .60 (20 gauge) smooth-bore barrel, and had a jointed ramrod (mounted on the right-hand side of the frame), which was used to load both barrels. Later, during the American Civil War, a lighter .35-caliber pistol with a .55 caliber (28-gauge) smooth bore barrel was produced, but as these were non-standard ammunition sizes (.36 or .44 caliber were most common for contemporary revolvers) LeMat owners had to cast their own bullets (as opposed to being issued them from general military stores.) 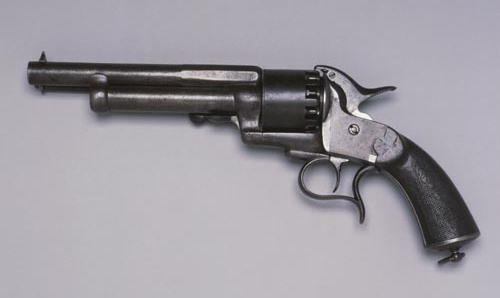 The final models of the LeMat were produced in .36 or .44 caliber in response to these criticisms, but too few of them managed to get past the Union blockade of the South during the Civil War to be of any real use. See also Civil War Weapons, Firearms, and Small Arms. With limited genuine LeMat’s in circulation, each may be worth several thousand dollars. There are, however, innumerable LeMat replicas and reproductions in circulation. Prior and during the Civil War, both sides continued to acquire, capture, manufacture, and even modify their respective firearms, small arms, guns, rifles, pistols, and weapons. As the conflict progressed, squirrel rifles had been modified, shotguns had their barrels sawed off, and smoothbore muskets rapidly became obsolete. During the war, the rifle was the most common weapon found on the battlefield, and the majority of the rifles during that time were loaded with a small lead musket ball or with a Minie ball (or Minié ball) and black powder. Most rifles of this era were muzzle loaded rifled muskets. These rifles were used by both the Union and Confederate armies. See also Civil War firearms and small arms. and The American Civil War soldiers and their firearms and weapons. Jayne Cobb, a character from the television series Firefly and the movie Serenity, employed a handgun based on the LeMat revolver. Bruce Willis' character in the movie Twelve Monkeys was equipped with a LeMat for a time-traveling mission into the past to assassinate a bioterrorist. Swede Gutzon was armed with a LeMat in the film The Quick and the Dead. Dr. Theophilus Algernon "Doc" Tanner in the Deathlands novels used two different LeMat revolvers. W. P. Inman, a Confederate in the novel Cold Mountain by Charles Frazier, carried and fired the LeMat. Bufe Coker, a character in both the novel and miniseries Centennial, utilized the LeMat revolver. Ezra Justice in the novel "The Justice Riders" written by Chuck Norris wielded a LeMat revolver. *Dr. Jean Alexandre Francois LeMat (1824–1883) is best known for the percussion cap revolver that bears his name. LeMat, a New Orleans physician, secured U.S patent #15925 for his design on October 21, 1856. British patents for the same design were issued in 1859, and he later designed a revolver rifle of similar concept as the handgun. About the Author: John F. Graf is editor of Military Trader magazine and author of "Warman's" Civil War Collectibles: Identification & Price Guide. Customer Review: I found this to be a very informative book on Civil War Firearms. This is not an era from which I collect firearms, but I wanted information on it anyway. With more than 500 black-and-white illustrations, this is a welcome addition to gun enthusiasts as well as Civil War buffs. Customer Review: This is an indispensable book for all Civil War aficionados, covering everything from pistols to ironclads and steamships. The author's own illustrations add to the charm and value of this publication and make its information accessible even to the novice. Many Civil War buffs have known this book for years and will be delighted to find that it is once again readily available. A true classic, this book belongs in every Civil War library! Small Arms at Gettysburg: Infantry and Cavalry Weapons in America's Greatest Battle covers all of the individual soldier's weapons--muskets, rifle-muskets, carbines, repeaters, sharpshooter arms, revolvers, and swords--providing a detailed examination of their history and development, technology, capabilities, and use on the field at Gettysburg. Here we learn that the smoothbore musket, although beloved by some who carried it, sang its swan song, the rifle-musket began to come into its own, and the repeating rifle, although tactically mishandled, gave a glimpse of future promise. This is the story of the weapons and men who carried them into battle during three days in July 1863. About the Author: Joseph G. Bilby served as a lieutenant in the 1st Infantry Division in Vietnam in 1966-1967. He is a columnist for Civil War News, assistant curator at the National Guard Militia Museum of New Jersey, and is author of A Revolution in Arms: A History of the First Repeating Rifles. Coates and Thomas have produced a very usable and informative work. Titling it an "introduction" is somewhat misleading. While it might only be 96 pages long, it is a very full and well illustrated 96 pages. Certainly it is not fully detailed and does not present all arms, but neither is this a superficial sampling. The overall format is an introduction to each weapon with basic specifications, several paragraphs of text about development use and production, a photograph of the weapon, a period photograph of a soldier armed with the same, and a photo of the cartridge. This is repeated for each major weapon. There are also several other general information sections about various aspects of small arms. Of considerable use to wargamers is a section listing known weapons of MANY regiments (approximately 1,000). They rode in the holsters of explorers and adventurers across the world and granted safe conduct in the back–alleys of the Industrial West right up until the last quarter of the 19th Century. Handguns possess a mystique distinctly different from that of other firearms. They are tools of personal empowerment-chosen by their owners to provide independence and freedom of movement. In the ambitious, optimistic early years of western industrial civilization they were the emblem of liberty and equality and the bane of repressive governments and social movements. Largely because of the traditions that emerged in the time of the caplock pistols and revolvers, they remain so in the early years of the 21st Century. About the Author: Johnny Bates and Mike Cumpston live in central Texas. The lifelong shooting enthusiasts have researched and written many articles about modern and historic firearms, which have been published in mass-market magazines. About the Author: Dan Shideler is a firearms book editor for Krause Publications. His works and articles have been published in Gun Digest Magazine, American Rifleman, and a variety of other shooting and outdoors-related publications. He resides in Goshen, Indiana. References: North Carolina Museum of History; Time Life Books; Echoes Of Glory; Hard Tack And Coffee; Atlas Of Official Records; The Muzzleloading pistol; Black Powder Gun Digest; The Confederate LeMat Revolver, Doug Adams, Mowbray Publishing, 2005.